Samsung Galaxy S8 will reportedly not have 3.5mm headphone jack | What Hi-Fi? Much like the iPhone 7, the Galaxy S8 smartphone looks set to lose the 3.5mm port. Following in the footsteps of Apple's iPhone 7 and iPhone 7 Plus, which dropped the jack in favour of the Lightning connection, it appears that Samsung's next Galaxy phone may also arrive minus the 3.5mm headphone jack. 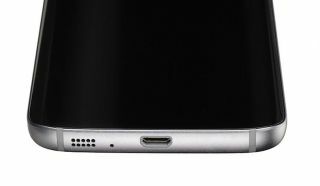 According to Sammobile the Galaxy S8 will only have a USB-C port. This would not only mean your standard headphones wouldn't fit without an adapter, but also that you wouldn't be able to charge your phone and listen to music through wired headphones simultaneously. The theory, somewhat predictably, is that this would make the Galaxy S8 thinner while still allowing for a bigger battery. It's also now rumoured that the Samsung S8 won't have a 4K screen as previously thought, instead favouring a '2K' resolution display, in line with the current Galaxy S7 phone. Samsung is likely to officially unveil the Galaxy S8 in February 2017 at the Mobile World Conference (MWC).